ironSource mediation platform allows you to tap into the ad inventory of the industry’s leading ad networks. Once you’ve integrated the network adapter in your code, you will need to set up the networks on the ironSource platform. 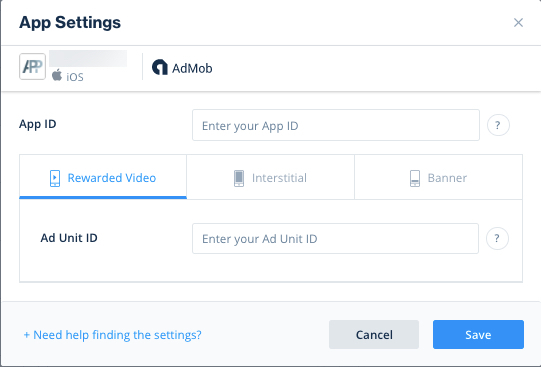 Make sure you have correctly integrated the ironSource Rewarded Video, Interstitial or Banner ad unit in your application. Set up the Rewarded Video, Interstitial or Banner ad units on the ironSource platform. Click on Available Networks and you will be able to select the ad networks you’d like to configure for the ironSource mediation. Enter the required information of your account on the selected ad network. You must have an active account with this network to serve their ad inventory in your app. This data input is necessary so that these ad networks can recognize the ironSource mediation and your specific settings for the ad delivery. Every ad network has slightly different requirements; read our mediation guides for each ad network to learn how to find the specific data necessary for every ad network. If you entered the data correctly in step 2, you will see the ad network in the Setup section. You will then see the below window. The required input differs based on the ad network. New! 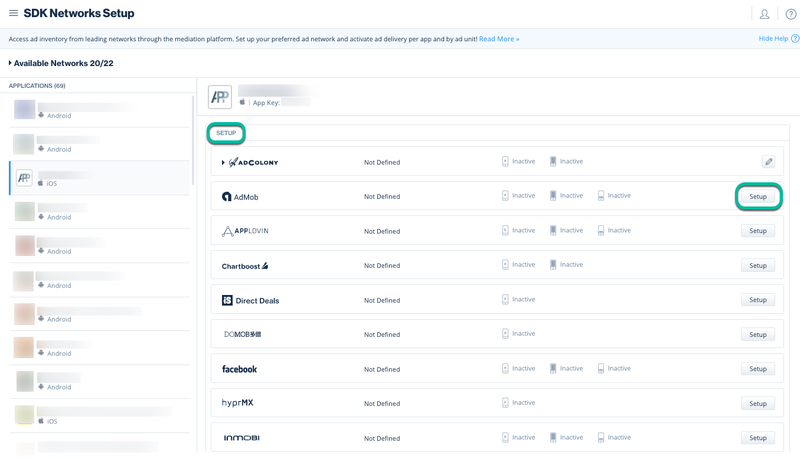 You can now leverage additional ad delivery instances of AdColony, Facebook, Tapjoy, UnityAds, Vungle and AppLovin. We support multiple network instances for Rewarded Video and Interstitial. Multiple placements in the waterfall for these ad networks help optimize ad revenue. 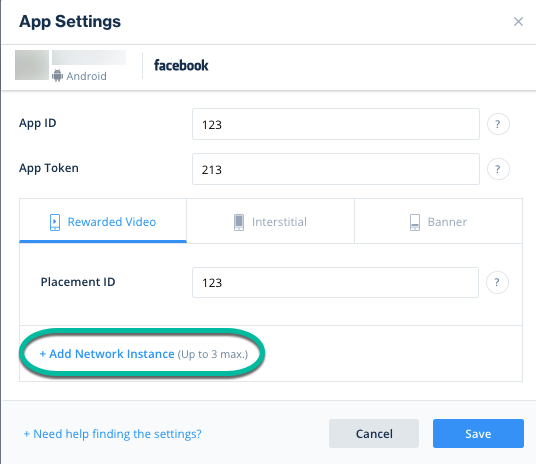 You can choose to position one instance in the Manual section with an exclusive deal with the ad network, while also serving another instance of this ad network in the Auto Optimization section; thus expanding your revenue opportunities from a single network. To set up a unique placement for this instance in the ad network’s dashboard, make sure to fill all the relevant values for each instance. The value you enter must be unique for this instance. To add multiple instances of the ironSource network, you will simply be required to enter a unique name for the instance. Activate the ad delivery per ad unit for each ad network by setting the toggle to Active. In case you’re working with multiple instances, you can activate ad delivery by instance. Note: Apps that are not defined yet will appear grey. 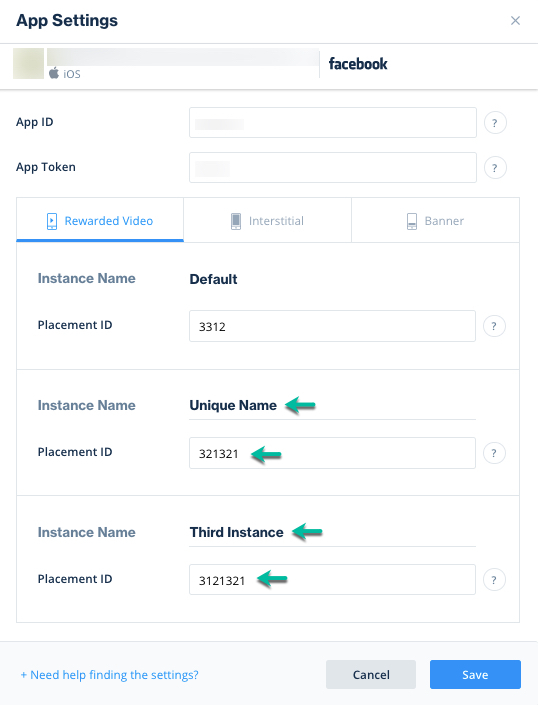 Once you’ve defined your app, you will see it clearly in the Applications list. To ensure transparency and seamless integration success with our mediation partners, we’ve added a Reporting API verification column in the Setup section. 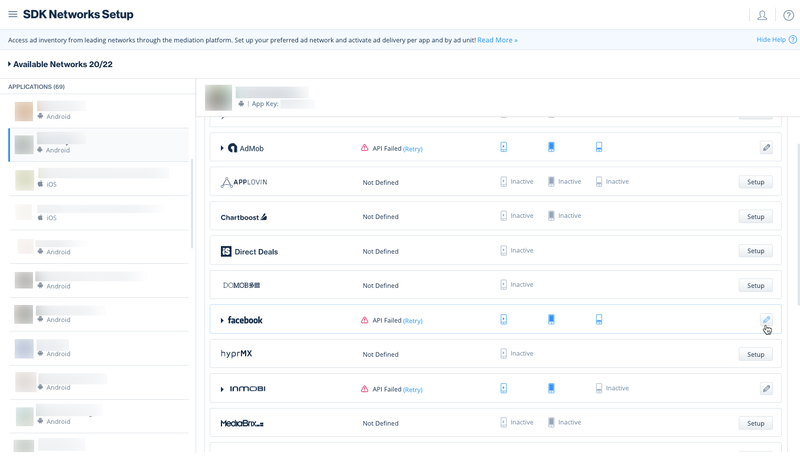 Once you’ve entered all the required credentials, and completed the above steps, you can verify that the selected ad network has been correctly setup in the Reporting API. You’ll receive one of three possible responses: Verified, Failed and No Response. You have now set up your selected ad networks on your ironSource Mediation Dashboard!